Saints Row is back again in its fourth instalment with Saints Row IV, promising to be even bigger and wackier than ever before! Recently I had the opportunity to go hands on with the game and apart from being stared down by the female police and bodyguards around the building, I felt that it was pretty solid overall and stuck to the spirit that makes the Saints Row games what they are. This time I was able to see the events that lead up to the leader of the Saints becoming president but due to such information potentially spoiling everything… I won’t mention it, but I will say that it was just awesome! 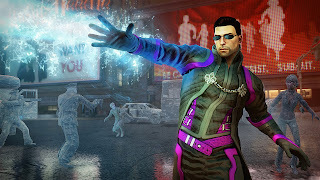 So the new game takes place 5 years after Saints Row: The Third where the leader of the Saints (now President of the United States) is about to address the media, but then suddenly, you’re attacked by the gentlemanly sounding alien force called the Zin who wish to put the planet under their control. After trying to take down their forces, your crew is kidnapped and after a brief scuffle with the leader himself, you find yourself outmatched. Fast forward now and we’re presented with the digital version of Steelport. Here I spent the remaining time, however there is also the regular Steelport we all know and love which you will get to play in the final version, so I expect there to be a lot of switching between the two. Now digital Steelport as I call it is most likely the better version because it’s here that you can use your super power… that’s right super powers! And some of which are incredibly fun to use. The two standard powers that are available to you is the Super Jump and Super Speed, two of which you’ll be using a lot to travel around Steelport. The others are used more for when coming up against the enemy and can be upgraded by collecting these clusters which you can find all around the city. The powers available to you are Super Jump, Super Speed, Telekenisis, Fire, Blast and Rock. Now you might be thinking that with the super powers, you could turn out to be incredibly… well overpowered; however that’s not the case here. Volition has kept things balanced enough that if you do end up getting too cocky, you’ll pay for it. The amount of Zin that you could possibly come up against at one time is crazy enough as it is, seeing that as you take down 10 of them, another bunch have already arrived to duke it out with you. It’s not all so straight forward however, as they approach you in a variety of different ways, some decide to roll up in their alien cars while others are attacking from the air or bring along a mini ship to constantly keep on your tail. Lastly there are some pretty cool weapons that have been added to the game this time, my most favourite being the Dubstep gun. Using this gun will produce dubstep that you can bop your head to, but also decimate your enemies with. The funny thing being that anyone within the range of the Dubstep gun that isn’t being shot at directly will automatically start dancing. The Singularity Black Hole Launcher is easily the most overpowered weapon in the game as it can take out a group of enemies by sucking them into a blackhole and then exploding afterwards. When you’re in trouble, it’s the best weapon to go to; however it’s currently not known how far you would need to advance in the game to acquire it or if there are any special conditions you would need to meet in order to obtain it. Saints Row IV indeed looks to be even crazier than the previous title. This time the crew is taking on an enemy that far surpasses the standard street gang which I think allowed the development team to go above and beyond by really letting their creativity flow into the gameplay and overall mechanics and while I have mentioned this before, I really like the Dubstep Gun… pure genius. Saints Row IV is scheduled to be released on 23rd August for PlayStation 3, Xbox 360 and Windows PC.